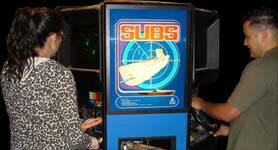 SC3 prides itself on its arcade games: high-quality, vintage cabinets featuring bonafide classics as well as enjoyable rarities. Attending an SC3 event is like stepping back through time, into an '80s arcade, except that the controls actually work and no quarters are required. 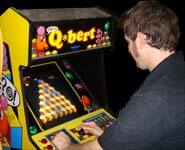 The games run the gamut from all-time classics like Ms. Pac-Man and Q*Bert to laserdisc games like Dragon's Lair and Cliff Hanger, to obscurer titles like Professor Pac-Man and Mad Planets, to games with specialized controls that just don't translate well into emulation, such as Star Wars and Tron. Most of the cabinets are in such good condition that they look like they were manufactured recently – not over 20 years ago. But wait – there's more! 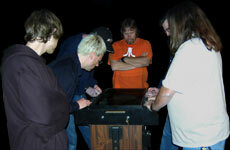 SC3's arcade parties attract other coin-op collectors, many of whom surprise us by bringing their own machines. That's right: even we don't always know what machines we'll have on hand at a meeting! 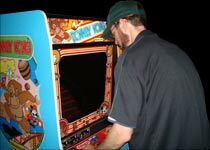 At past events, our friends have brought a beautiful row of vintage Nintendo cabs, a great looking Gravitar, pimped-out cabinets for Ms. Pac-Man and Joust, and a lot more!